Jef Zapata has done it all when it comes to Garbage Pail Kids. He’s done final art for the cards, card concepts, sketch cards, was Art Director and Editor at Topps during the ANS days, but perhaps his biggest mark left on the hobby will be his involvement with the 30 Years of Garbage documentary. Together with Joe Simko, they wrote and directed the movie which recently saw its premier in New York City. 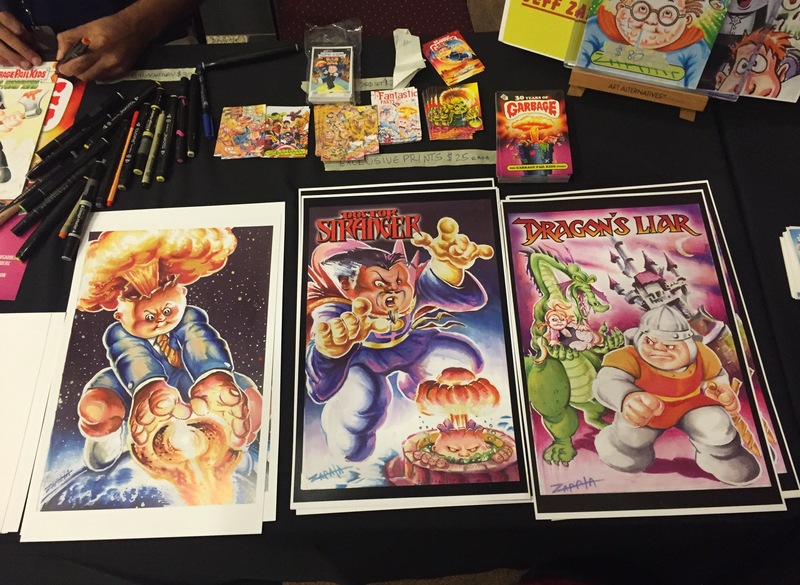 I sat down with Jeff at the GPK-Con in Las Vegas recently. We discussed making the movie and some of his favorite memories during the filming. We discuss his time spent as Art Director at Topps, his favorite and least favorite projects. Jeff also talks about what is next for him and his artwork. 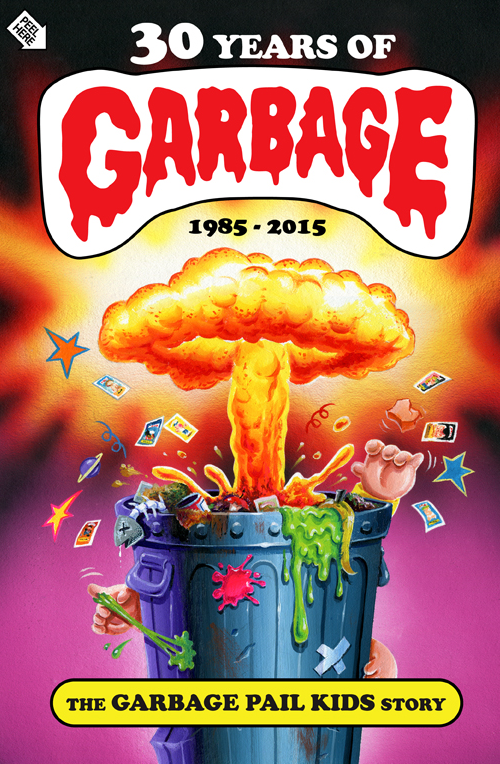 GPKNews – First off, congratulations on the 30 Years of Garbage Doc. I got my backer package in the mail and watched it, it was great, I really enjoyed it. What has struck you about the reaction the movie is getting? 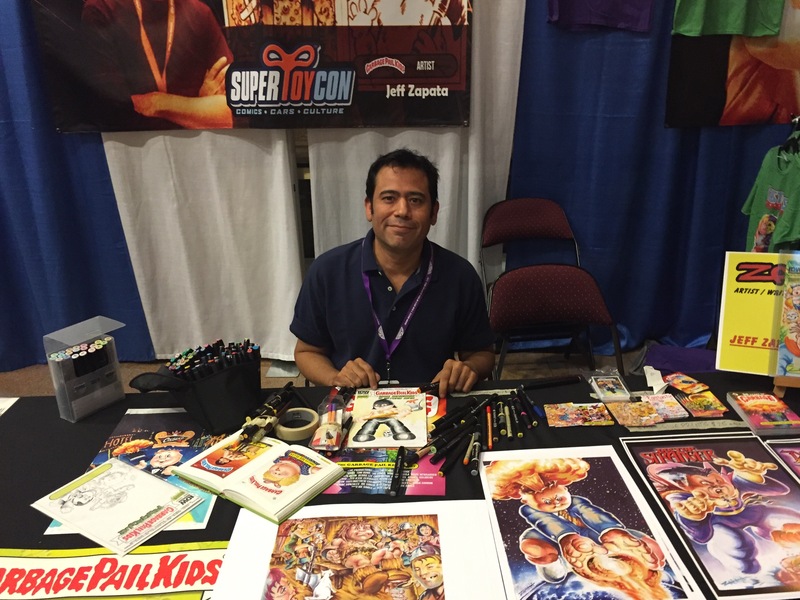 Jeff Zapata – I’m really excited that people like the history of Garbage Pail Kids. That was one of my main concerns with the movie was showing stuff I always heard in the Topps offices and wanted to let the public know about it. The people like Woody Gelman, which you’ll hear his name out in the movie, in the early years of Topps who I considered invented the Non-Sport card genre. You’ll hear it from the masters themselves like Art Spiegelman, James Warhola, and Len Brown who was my mentor. What I’m excited about is people get to meet these guys who were never really up front in the cards or you would hear about on the boards, but they had a lot to do with the history of Topps and why we collect cards. GPKNews – You got to work on this project closely with your good friend and fellow GPK artist Joe Simko and his wife June, how was that experience? JZ – It was really great because Joe and I knew each other through work. We also lived close to each other at the time, and when you’re on the road you really get to know each other. Each of us sometimes had weak moments, but we had the other one help lift the other up. Whether it was physically or emotionally or whatever, but because of that we are really tight. We had a really great experience, it was an adventure, an odyssey if you will. An odyssey to meet all these artists. It was two generations, Joe is a lot younger than I am and he is the new generation of artist, and I was sort of still with the old but in between, I was the in between guy. June, I can’t say enough about her, I really can’t. She did so much grunt work that’s not seen on the film. We had another partner on the film who left which I wish I could mention more often, but due to legality I can’t, but he did a lot of work. June was a great, great asset. She helped finish with the kickstarter stuff, help fulfill orders, and edit things that our regular editor didn’t finish doing. Without her a lot of the work wasn’t done. GPKNews – Do you have a highlight or story that stands out with you about the filming of the doc? JZ – John Pound was really interesting because John Pound and Mark Newgarden were one of our last interviews to do that we thought we might not get. One was too shy, which was John Pound. He’s a very personable nice guy, but he’s just a shy guy. Most good artists are. Seeing him in his home and watching him be relaxed and talk about himself for the first time, he knew this was for a historic thing. Me and his wife encouraged him to do the interview. When we did the interview I told him to pretend the cameras aren’t here and talk to me as if we were talking in the office, because we would just talk about things that had nothing to do with cards. I think that interview was really golden. You also see where Adam Bomb was created and see where all that history was done. I think behind every great man there’s a great woman so I got to see who backed up John Pound. You could see without her a lot of thing wouldn’t have got done. GPKNews – Did you know what you were getting into when you started the project? It took a few years from inception to the premier. What were your emotions on the night of the premier, relieved? satisfaction? JZ – Everything that transpired I got to think more about the family, about Joe and June and all the stuff we went through. I was just so proud to see everything we did was on screen. When I was watching it, it was almost like the journey was unfolding in my mind even though I’ve seen the movie a million times before the showing. I was trying to look at it through the audience as well. I tried to look at it with fresh eyes. All I could do was think about the trip and the friendships and the family structure that formed after between Joe, I and June. The artists that we interviewed we all became family. When I saw the film it just kept coming up in my mind over and over again, it was just, wow I can’t believe we did it. As far as tribulations, there was a lot of them. We each took turns electing each other the president to fix them. It would depend on which problem it was. I was usually the ambassador for a lot of things. Joe and I wrote the story, and June and him edited it. It was a lot involved but it was one big family. GPKNews – In the movie you talk a little bit about your time as Art Director at Topps during the ANS/Flashback GPK days. What GPK set during your Art Director days were you the most proud of? JZ – I guess two of them, Series 4 I liked a lot. I don’t know why, I don’t remember why, but I think maybe it was the first time I did sketch cards. It was the first time Topps said, you know what, maybe you know how to do this better than us. That was then when I got to focus more on the artists I thought were doing well. It was the beginning of me trying to get a little more control of it. I never did get that control. It was only when I left when things were changing and a lot of bosses were leaving who used to really control that stuff. I said nobody is looking, let me go back to the original design and don’t have busy backgrounds. That was the magnet set. So the magnet set and series 4 was one of my favorites that stick out in my mind. Also which one has Orange Julius in it? (Ed. note: ANS 6 card 1a.) I don’t know, but that one sticks out for me because John Pound and I had such a beautiful conservation while drawing that. When he was making the painting that for some reason really sticks in my mind to this day about the orchard that I was describing to him, when I used to go to this orange orchard, and he drew it. He drew everything I described right on there. For some reason when I see it, it’s the epitome of everything GPK during those years. GPKNews – I know you also worked on many other Topps properties during your time there, what other project besides GPK were you the most satisfied with? JZ – Believe it or not, and people ask, what was one of your favorite card sets to do? I say it was Hannah Montana. I kind of felt it was at Topps you would go to the archives and you would see Beatles or Monkeys, I’m not saying they did that, but it was that sort of nostalgic card sets they used to do. So when I used to go to playgrounds and walk my dog, I would see Hannah Montana wrappers all over the place. When you’re an editor and you do these wrappers and you see an inch of it, you know its yours. You see it, and yeah that is my wrapper. That was great because there were no sketch cards in it, no autographs, and kids were buying them for the cards. I had to know everything about the show and Miley. Miley became a Wacky Pack fan, and I became a fan of Miley. For some reason I thought, this is bubble gum cards. This is what I was here for. To make bubblegum cards for kids to buy. So out of the weird ones, Hannah Montana was one of my favorites. Then I did WWE. I got to say I wanted to have fun doing that, but I didn’t. I loved doing Spiderman the movie. I thought that was great because I was a big superhero fan. Doing Marvel Legends was fun. But ones I didn’t like….In Sync. I did In Sync, that was horrible. The Toy Stories I wanted to love, but Disney was so hard to work with about getting information. It was always getting mixed up. I did a lot of Disney products. That Club Penguin I hated doing. Let me see which others ones I hated, there was a bunch. I got to say those stick out as the ones I didn’t like doing. Enduring Freedom they had me start doing. I just bowed out because I didn’t like making money out of tragedy, and they respected that. GPKNews – How’s the work coming on the sketches for the upcoming GPK Trashy TV set? You have shown some of the sketches you are working on via Facebook, they look fantastic! JZ – I’ve done all the puzzles and all the shaped sketch cards. What I’m trying to do with this one, is trying to be more powerful and cosmic. The characters I really want them to have more dynamic poses, and the backgrounds are going to be very Jack Kirby cosmic looking backgrounds. It might be my farewell set. I don’t know if I’m going to do sketch cards for a while. I wanted to do something different. I’m going to do color and inks on them when I usually do just colors or inks. I’m going to do both, it’s a first for me doing all the sets that way. Each character I’m going to draw from head to toe. So even though there are characters that don’t have toes or legs, you’re going to see them for the first time in this set I’m doing. GPKNews – During the artist seminar you broke the news that you are possibly going to be returning to doing some final paintings for upcoming sets, is that going to be for the Adam-Gedden set? JZ – I’m not sure. They sent me a contract a while ago and said, hey why don’t you get back. I told them I was interested. I was always a gag guy at Topps. I did a lot of gags, hundreds of them. I did some for the BNS series I think. I just want to get back into doing some gags. If the gags then might lead to me doing some new paintings. Let’s see we will take it step by step. Topps is changing all the time. The management and the products change. I wanted to wait to when things died down, but I’m looking forward to sinking my teeth into them again. GPKNews – At the show you are selling your own card set and some prints. Any other projects you have in the pipeline? JZ – I wasn’t expecting this set until the last minute. I just found stuff on the computer and gave it to Clint Coleman, who’s been a great supporter of this Con and me. I told him lets make some more when I’m concentrating on this. I might do some more alternate universe GPK cards. I think people know my version of Garbage Pail Kids. They almost look like a adults. They are in dramatic situations, and they have realistic humans around interacting with them. I think I want to do a set like that, and do a real one that gives it justice. GPKNews – Finally what’s your favorite Garbage Pail Kid? JZ – I’ve been asked that all weekend and I think I settled on Dead Ted. I think a lot of us said, besides dead ted, besides Adam bomb, and besides alien Ian, because I think those are the most popular ones. Which other one? I have my favorites from the All New Series, but those top 3 have always been my favorites. I would say Joe Blow is another one I love, and New Wave Dave. Those guys stick to mind I don’t mind drawing them. I love drawing Dead Ted and Adam Bomb. Those have always been one of my favorites, and Evil Eddie. I always considered Evil Eddie and Adam Bomb to be the Daffy Duck and Bugs Bunny of the universe. If you ever see me do the comic books or covers I always try to put them together and have an Abbot and Costello type of thing going. I even did a cover of Adam bomb and Evil Eddie meet Frankenstein and it was based on Abbot and Costello meet Frankenstein, I’m proud of that one. This entry was posted in 10 Questions With, Artists, Interview and tagged 10 Questions With, Artists, Interview by Jeff. Bookmark the permalink.